In a dream world, what would your day look like? Would you be doing the exact same thing you do now? Or would your day look entirely different? Perhaps there are bits and pieces that are perfect, things that you wouldn't change at all. And then there are a few aspects of day to day life that you wouldn't mind looking a little different. 24-hours in the day seems like not enough time to accomplish everything. But that's half the fun - challenging yourself to fill the day with activities and tasks that are both rewarding and enjoyable. Reading the newspaper. Going for a run out in a forest preserve. Spending 15 minutes a day in quiet medication. Write. These all sound wonderful and are clearly a part of my dream day. But the #1 thing that will always find its way onto the itinerary for my dream day? Enough time in morning to relax outside on a porch or balcony, enjoying a large cup of coffee with a delicious well-balanced breakfast. In reality, the number of times I am truly able to pull this off is few and far between, but after all, isn't that why I prefaced this article by asking about your dream day? What does your dream day look like? Do you have any toast recipes that you love? Spread whole wheat toast with Greek yogurt. 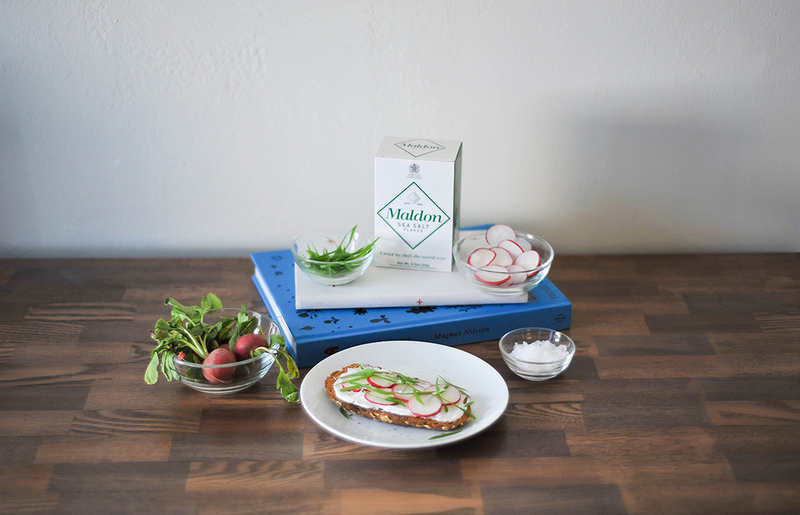 Top with shaved radishes, sliced scallion, and flaky sea salt.